The word [vermis] is Latin and means "worm". The term [vermiform appendix] means "the worm-shaped appendage", and refers to a worm-like appendage that is related to the cecum, a segment of the right colon. The location of the vermiform appendix is also subject to anatomical variation, being found in a retrocecal position in 65% of the cases. For more information on this organ's anatomical variations, click here. The vermiform appendix is an intraperitoneal structure, as it has a peritoneal extension called the mesoappendix. Within the mesoappendix are the appendiceal arteries and veins. The appendiceal artery is usually a branch of the ileocolic artery. 1. 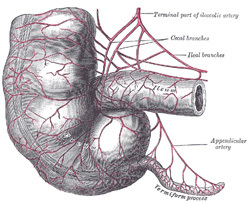 It is not proper to call this structure the "appendix", as there are many appendices in the human body. 2. Personal note: The longest vermiform appendix I have personally seen was 8 inches (20.3 cm) in length, retrocolic, and the tip of the organ was actually retrohepatic!. Dr. Miranda.